Nigeria had more than 70 candidates for president when campaigning began for Saturday's elections. A reputation as a staunch opponent of corruption was key to Buhari's victory at the last election. But Buhari's anti-corruption cachet has remained strong among his supporters and helped him run successfully in 2015 against Goodluck Jonathan of the People's Democratic Party (PDP). The party had been in power since Nigeria returned to democracy in 1999. Despite a lack of corruption convictions, Nigeria's first recession in 25 years and a resurgence of Islamist attacks, those policies are little changed for the 2019 race. He earned the nickname 'Baba Go Slow' during his first term when critics said he governed at a glacial pace, particularly when low oil prices caused a currency crisis. The moniker first entered popular usage to describe Buhari when he took six months to appoint a cabinet. Atiku Abubakar is the 72-year-old candidate for the PDP, the party that inherited power from the military in 1999 and governed for the next 16 years. 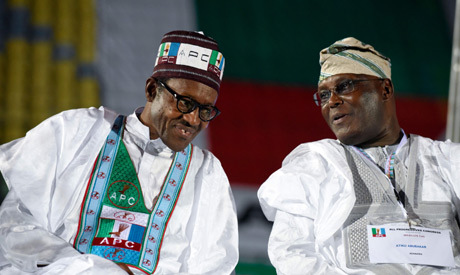 For the first eight of those years, Atiku was vice president to Nigeria's new democratic leader and former military head of state, Olusegun Obasanjo. Atiku switched sides again in 2017, and last year emerged as the PDP's candidate. He has promised to "make Nigeria work again", lifting it out of the economic doldrums with business-friendly policies that he says will create jobs.